To begin with, IÕd like to consider what prompts this topic. We are interested in it because Shakespeare is an author with CloutÑhis works comprise a treasury of cultural capital. Cultural Capital is a term invented by the French sociologist Pierre Bourdieu that has gained currency among scholars in a variety of fields, especially those associated with the school of New Historicism that emerged in the early 1980s. New Historicists concern themselves with the interplay between art, money and power, and they study works of literature in social and historical context. They ask how works of art embody, support and challenge the ideology of the power structure of the times and places they were produced, and also how they function as tools of power and ideology in later times. Most of my talk will focus on these questionsÑhow is ShakespeareÕs clout used by people in and out of power today, and how did Shakespeare relate to some of the political issues of his own time. ItÕs no accident that New Historicism originated among Shakespeare critics like Stephen Greenblatt, since Shakespeare has accumlated more prestige or cultural capital than any other writer or text since his time. 'In religion, | What damned error but some sober brow | Will bless it and approve it with a text | Hiding the grossness with fair ornament?' (3.2.77-80). As with the Bible, so with the Bard: liberals and conservatives, Democrats and Republicans, neocons and libertarians, generals and war protesters all claim to have them on their side. More recent examples abound on the other side of the political spectrum. This is a very successful enterprise catering to CEOÕs, Politicians, and Military Top Brass. ItÕs run by Carol and Kenneth Adelman, a Republican political consultant who was President Ronald Reagan's chief adviser on arms control. A member of RumsfeldÕs Defense Policy board, he is famous for the remark that the war in Iraq would be a cakewalk. One of their clients is James G. Roche, former secretary of the Air Force, for whom the couple had run seminars between 1999 and 2001 while he was a vice president at Northrop Grumman. For the last two years they have been contracted to do this for the military at taxpayer expense. ShakespeareÕ biographical history of this King combines action, suspense, romance, and stirring patriotic rhetoric with deep characterization emphasizing the difference between the king as charismatic performer on the stage of history and his internal struggle with fear, resentment and doubt. Shakespeare also gives voice in the play to trenchant criticism of the King and his policies. At its core, his Henry V is a study of successful political leadership, the embodiment of MachiavelliÕs Prince. From early on, both the historical Henry and ShakespeareÕs version have elicited strongly opposed responses. Throughout the nineteenth century productions of the play were staged to glorify the expansion of the British Empire with emphasis on the cry in Act III, ÒGod for Harry, St George and England.Ó The propagandistic nature of the play reached its pinnacle with Sir Laurence Olivier's film, promoted and financed by Winston Churchill. Premiering in 1944, its aim was to raise English spirits during the dark days of World War II. All these productions were heavily cut, deleting the many passages of the text that might question the idealization of the hero. During the Vietnam era, productions by The Royal Shakespeare Company in Stratford, the Canadian Shakespeare Festival and the American Shakespeare theatre took strongly anti-Henry anti war stances. Kenneth BranaghÕs 1989 theatrical production and popular film, reflecting an influence of the recent Falklands war and partially financed by Prince Charles. took a somewhat balanced view of the war, displaying its grittiness and brutality, but in the end thoroughly glorifying the young kingÑas well as its young director and star. 3. The fact that the clergy support is gained by Henry as quid pro quo for his opposition to a bill in parliament that would expropriate their lands. The gates of mercy shall be all shut up. EnlinkÕd to waste and desolation? 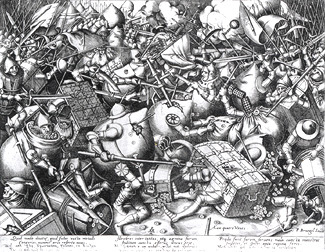 Though this passage makes Henry appear quite monstrous, the full text of the play adds more complexity by suggesting this is really a brilliant bluff that intimidates the fortified town into surrender without bloodshed, though Henry and his exhausted troops were incapable of carrying out the threat. "Let's see what we have here. We have a king whose father had been a king. We have a king who spent a carousing youth," said industrialist and Shakespeare Theatre trustee Sidney Harman as he introduced the program. David Brooks talked about the fact that while prewar counsels could emphasize prudence, it was a wartime leader's job to rally a martial spirit and "get people to stop thinking prudently." Ariana HuffingtonÉvigorously demurred, spitting out a stream of comparisons unflattering to both Henry V and George II. Henry's invasion of France was not an invasion of necessity, she said, but one of choice -- and "there can be no moral war of choice." Ken Adelman, [he keeps showing up] talked about Henry's much-debated decision at Agincourt.. to order his French prisoners killed. AdelmanÉ last week had explained to a reporter that he was "ducking" press calls about Abu Ghraib. At the end of the Shakespeare Theatre debate, Isaacson turned the job of judging a "winner" over to Dame Judi Dench, the great British actress É Dench professed herself unfit for the task: She's a Quaker, she said, and cannot understand why such wars should begin. Then she turned to the last lines of "Henry V," spoken by the chorus, as a way of summing up. "This star of England: Fortune made his sword," she read, "by which the world's best garden he achieved." Yet it was all for naught, because the young Henry VI and his advisers promptly "lost France and made his England bleed." Appropriating ShakespeareÕs Clout to declare what he would think about present day political issues is risky business, since we have no record of his opinions, only those he put into the mouths of his characters. And they contradict one another and themselves, and often speak with irony or sarcasm. Nevertheless itÕs tempting to look for what the dramatist himself might have been thinking about politics in the context of events and debates of his own timeÑthe sixteenth and seventeenth centuries, known today as the Renaissance or Early Modern period. Reflection upon war and peace was at the heart of the Renaissance Humanist movement, just as the conduct of war and peace was at the foundation of the European state system during the early modern period. The humanist response to war and peace often split into opposing positions categorized as martial vs. irenic--that is militarist vs. pacifist. Militarists like Caxton, Machiavelli and Guiccardini lionized an ideal of the prince or courtier as soldier and scholar and regarded the warrior's activity as essential for individual achievement as well as for social order.Their pacifist opponents, like Erasmus, Thomas More, Baldassare Castiglione and Juan Vives envisioned the ideal prince or courtier as a jurist and philosopher, and criticized the military ethos as irreligious, immoral and impractical. This debate shaped the actions of monarchs, the deliberations of councils, the exhortations of divines, as well as the imaginative productions of artists and writers of the time. "A prince must not have any other object nor any other thought, nor must he take anything as his profession but war, its institutions, and its discipline; because that is the only profession which befits one who commands." So Machiavelli opens chapter XIV of The Prince entitled "The Prince's Duty Concerning Military Matters." His equation of sovereignty with military strength was both traditional and innovative. Since the fall of the Roman Empire, European political power and social status were vested largely in a warrior elite descended from Germanic chiefs. Their martial values and cultural identity were sublimated by the intellectual and bureaucratic legacy of the Church of Rome into the institutions of feudalism and the ideology of chivalry, but Europe throughout the Middle Ages retained the underpinnings of a warrior culture. But if militaristic approval of war was dominant, it was by no means monolithic. In 1516, three years after Machiavelli sent The Prince to his patron, the most prestigious humanist in Europe, Desiderius Erasmus, published The Education of a Christian Prince (Institutio Principis Christiani ), which he wrote as a handbook for the future Emperor Charles V. In it, he advocates an "Art of Peace" contrasted to Machiavelli's Art of War. Rather than normal health, Erasmus sees war and violence as aberrant pathology--in nature, in society and in the individual. Rather than identical with force, Erasmus sees power or authority as distinct from it. The duty of Erasmus' prince consists not of making or preparing for war, but rather of avoiding it and serving his people, on whose satisfaction he depends for legitimacy. Real power and true heroism lie not in physical dominance over others but in self mastery. To establish and maintain peace should be the goal of all princes, a goal achieved by the greatest spriritual and temporal leaders in history, Jesus and Augustus. "There is scarcely any peace so unjust, but it is preferable, on the whole, to the justest war. Sit down before you draw the sword, weigh every article, omit none, and compute the expence of blood as well as treasure which war requires, and the evils which it of necessity brings with it; and then see at the bottom of the account whether after the greatest success, there is likely to be a balance in your favor." Between 1517 and 1529 alone, The Complaint of Peace went through twenty four editions and was translated into most European languages The visual arts of the sixteenth century display further evidence of pacifist sentiment. Peter Brueghel's "War of the Treasure Chests and Money Bags" (1567) illustrates the satirical indictment of conducting wars for plunder and profit. The poles of this dispute generate a grid upon which Shakespeare's plots, characters, and themes can be charted--both in individual plays and over the course of his career. That career begins with the Marlovian militarism of the first history tetralogy and the glorification of violence in Titus Andronicus andTaming of the Shrew, all written during the early 1590's. In the middle nineties, with King John and the four plays of the second history tetralogy, the battlefield remains the arena for the exercise of both individual and collective virtue. In chivalric celebration of war, in Henry V Shakespeare aims the full blast of his rhetorical power at the audience . The choruses inflame us to collaborate with the author in producing a spectacle to sweep away thought in a flood of patriotic passion. Along with the thrills of rockets red glare and bombs bursting in air, he invokes the romantic appeal of battle as an occasion for displaying mettle under fire in the face of bad odds. Chivalry also provided ethical rationales for war which this play repeatedly invokes. Since Augustine, the church had evolved a doctrine of "just war" to regulate the military aristocracy and to exempt it from Biblical taboos against killing. Justification resided both in legitimate war aims--jus ad bellum--and in legitimate conduct of fighting--jus in bello. Shakespeare's Henry is extremely fastidious about securing these justifications, without which, he avers, his course is one of butchery. This play also asks us to admire Henry's Machiavellian effectiveness. It depicts him mobilizing the cynical self-interestedness of all of his subjects, and it shows his success at melding those conflicting interests into the common purpose of making war on France. On the eve of the decisive battle, Henry declares his Machiavellian ethos: "There is some soul of goodness in things evil.../Thus may we gather honey from the weed/And make a moral of the devil himself." (4.1.1,12) As he kisses Katharine against her will, against custom, Henry asserts, "nice customs curtsy to great kings...We are the makers of manners Kate, and the liberty that follows our places stops the mouth of all find- faults"(5. 2.263). Henry makes his own rules in love as well as in war, like the hero of The Prince. The debate within the play mirrors the rivalry in Elizabeths court between the war party and a peace party during the last few years of her reignÑthe warriors like Essex and Ralegh eager to lead protestant England against the Catholic Irish, Spaniards and French, the peace party of Cecil, Lord Burghley, anxious to avoid foreign adventures and loss of treasure and life. Well before her deathbed appointment of James Stuart King of Scotland as her successor in 1603, Elizabeth knew of his pacifism. In 1599, James had published Basilikon Doron, a guidebook for princes dedicated to his own son and modelled upon Erasmus' The Education of a Christian Prince. Like the 1611 edition of his Works, the frontispiece of this book prominently featured a picture of "Pax" carrying an olive branch and treading on a figure of vanity staring in the mirror. Whether or not that figure represents Essex, his brand of swashbuckling militarism went out of favor during the final Tudor years. The dominant Stuart mode of expression might be characterized as a culture of pacifism. Troilus and Cressida, written in 1602 or 1603, marks a turning point. In it Shakespeare mounts an attack on classical war heros and on the very arguments for going to war he had supported earlier, and he undermines the whole set of values and symbols that constitute Renaissance military culture. The plays of Shakespeare's "tragic period" which follows Troilus and Cressida continue to focus on the problem of war, but with a deepening psychological penetration. Othello, Macbeth, Anthony, Timon and Coriolanus all are great generals whose martial virtues are shown to be tragically flawed. The plays in which they are protagonists reveal that military power, the highest value of both the hero and his society, is a concomitant of deficiency in power over oneself and finally the loser in a battle with the greater power of love. Troilus forms a companion piece to Henry V. Instead of glorifying, it condemns war and those who make it. In the earlier play Shakespeare counters pacifist objections to war with militarist rationales; here, he counters militarist rationales with pacifist objections. In reducing war from a providential tool to an instrument of chaos, he inverts the rhetorical strategies of Henry V and also shrinks the proportions of epic to the distortions of satire. The chorus of Henry V apologizes for "confining mighty men" of his story in the "little room" of the theatre, implying that the members of the audience are midgets in comparison to the heros who will be portrayed on stage. The prologue of Troilus, on the other hand--"armed, but not in confidence"-- introduces us to "Princes orgulous" with "chafed blood" and "ticklish skittish spirits," whom we may "like or find fault as our pleasures are." Compared to the self-inflated Lilliputians on stage, we spectators are cast as gods. The two major sources of the plot, Chaucer's Troilus and Creseyde and Chapman's translation of the Iliad, suggest the two militaristic ideologies which the play continually invokes and mocks: medieval Christian chivalry and classical pagan policy. These are usually associated respectively with the Trojans and the Greeks. The question of jus ad bellum --what is the just cause for making war?--is deliberated by the Trojan council just as it is by the king's council in Henry V. When Hector warns against the double evil of violating the laws of marriage and the laws of nations, Troilus rejects reason itself in favor of "manhood and honor": "Manhood and honor/ Should have hare hearts, would they but fat their thoughts/ with this crammed reason. Reason and respect/ Make livers pale and lustihood deject"(2.2.45-8). Emphasizing the very absence of jus ad bellum and the consequent immorality and irrationality of making war, Hector ignores his own reasoning, abruptly reverses his position, and goes off with Troilus to celebrate their coming victory. The justice of the Greeks' war aims in reclaiming Helen is never mentioned; their militaristic rationales are not chivalric. But their two Machiavellian mechanisms of policy, force and fraud, are set at odds in the struggle between Achilles and Ulysses, the lion and the fox. Thus split, the Greeks are as incapable of achieving their own purely pragmatic purposes for war--morale, prestige, and conquest--as the Trojans are incapable of achieving honor and love. As Thersites the clown: "the policy of these crafty-swearing rascals...is proved not worth a blackberry, whereupon the Grecians begin to proclaim barbarism and policy grows into an ill opinion" (5.4.10). It is the fool's perspective--the perspective of an outsider critical of assumptions that in general are taken for granted--that marks Troilus and Cressida 's genre of satire. A year after the play's first appearance, another anti-militarist satire called Don Quixote was published in the nation that most Englishmen thought of as their "natural enemy." That same year King James made a lasting peace treaty with Spain. If war is no longer validated either by a heroic tradition or by the arguments of Realpolitik, one is forced to confront the question of why human beings continue to wage it and suffer its attendant disasters. By seeking the answer to this question with the analytical and educational approach to social action of the old Christian Humanists, Shakespeare and other writers under James StuartÕs rule undertook pyschological and political studies of warriors and war-oriented societies in the attempt to understand and reform them. Many of their plays depict the demise of great military heros, not through the triumph of superior arms, but through failures of insight, compassion, and self-control attributable to an identity forged in battle. That make ambition virtue. O Farewell! "O world thy slippery turns! Friends now fast sworn...on a dissention of a doit, break out/ To bitterest enmity: so fellest foes/...by some chance/Some trick not worth an egg, shall grow dear friends/and interjoin their issues" (4.4.12). And his erstwhile opponents, " patient fools/Whose children he hath slain," ignore their enmity and " their base throats tear/With giving him glory" (5.6. 50). Following Erasmus' path, Shakespeare traces the causes of political violence to psychological aggression. Even before Coriolanus' first appearance, a citizen suggests the connection between the general's battlefield heroics and domestic neurosis: "Though soft-conscience'd men can be content to say it was for his country, he did it partly to please his mother and to be proud..." (1.1.37). As the play proceeds, the more he seeks to confirm his manhood in battle, the more infantilized he becomes. Like Macbeth's, Coriolanus' compulsive need to fight results largely from his vulnerability to the influence of a woman's vicarious aggression. His mother, Volumnia, is introduced as a horrifying creature: "if my son were my husband, I should freelier rejoice in that absence wherein he won honour than in the embracements of his bed where he would show most love...had I a dozen sons...I had rather had eleven die nobly for their country than one voluptuously surfeit out of action...the breasts of Hecuba/ when she did suckle Hector, looked not lovelier/than Hector's forehead when it spit forth blood/at Grecian sword, contemning"(1.3.20-80). "You are too absolute ...I have heard you say / honor and policy like unsevered friends/ I th' war do grow together: grant that and tell me/ In peace what each of them by th' other lose/ That they combine not there. Throng our large temples with the shows of peace/And not our streets with war "(3.3.36). "Our suit /is that you reconcile them: while the Volsces/May say 'this mercy we have showed' the Romans/This we received;' and each in either side/give the all-hail to thee, and cry 'Be blest/for making up this peace.'" "Coriolanus [holds her by the hand silent]: Mother, mother O/you have won a happy victory to Rome; /But for your son.../Most dangerously hast thou with him prevailed/If not most mortal to him....I'll frame convenient peace" ... Ladies, you deserve/To have a temple built you. All the swords /In Italy, and her confederate arms,/Could not have made this peace" (5.3.183-209). The cruel warrior has been transformed into a merciful emissary of peace who will approach the Volsicans with humility and tact, subordinating his own mixed feelings to the requirements of his diplomatic mission. The dramatic climax of Shakespeare's play enacts James' emblem: the triumph of Eirene over Mars. Such hoped-for outcomes guided James' foreign policy, as he negotiated armistice between the Low Countries and Spain and marriages of his children into both Protestant and Catholic royal families. The shift of ShakespeareÕs clout from supporting a hawkish worldview to supporting the outlook of a peacemaker can be ascribed to a desire to please his sovereign. After all, Elizabeth I commissioned the acting company he wrote for and held stock in as The QueenÕs Men and James commissioned it as The KingÕs Men. But on the basis of my readings of the plays, IÕd argue that after 1599, Shakespeare's own abhorrence of war became steadily more emphatic and that his enthusiastic support for James stemmed at least partially from a personal desire to further the king's peacemaking mission. It is true that after Shakespeare's death, James' continuing endeavors in this cause could not forestall the tragic outbreaks of either the Thirty Years War, in the latter days of his reign, or of the English civil war, during the reign of his son. Nevertheless, by recovering the early Humanists' rejection of military politics, culture, and ideology, both the mature Shakespeare and his royal benefactor strengthened a fragile tradition that too often remains ignored or denied. When this essay was published in 1992, it seemed to be of interest only to Shakespeare critics and Renaissance historians. But then came 9-11 and the buildup leading to the second Iraq war. In November 2002, I came across a website affiliated with The Ludwig von Mises Institute, a libertarian think tank in Atlanta Georgia. With so many high-toned writers these days recommending a return to the warlike "wisdom" of classical thinkers and their Renaissance interpreters, it is worth our while to look at other points of view. He suggested we collaborate on organizing a panel for the 2006 annual convention of the Shakespeare Association of America which brings together over a thousand academic Shakespeareans. Since then we have agreements to participate from David Perry, a professor who teaches ethics at the U.S. Army War College, Nina Taunton, a British authority on 16th century military discourse, Kent Thompson, artistic director of the Alabama Shakespeare Festival, who has mounted a production of Macbeth funded by the Department of Defense to tour military bases, and none other than Mr. Kenneth Adelman. The title of the panel is: ÒDrafting Shakespeare, the Military Theatre.Ó So here I hope is one answer to the question posed by your Humanities Inquiry 2005ÑWhy Shakespeare Matters.